There were huge smiles and laughter when the guests spotted the spaceship, the alien autopsy room and the living alien table (complete with delicious snacks!) dancing on the dance floor. 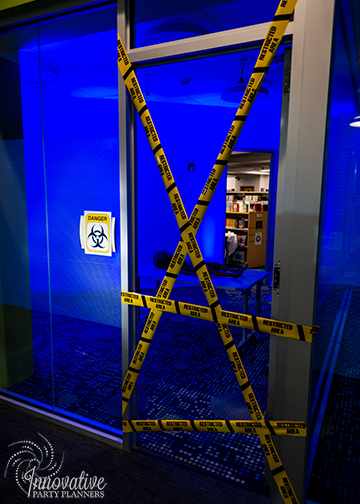 The atmosphere was only enhanced by strategic lighting, scattered beakers filled with mysterious colored liquids and staff who participated in setting the scene. The event included fun video arcade games, a jumbo alien version of a childhood favorite, ‘Operation Game’ and the opportunity to get their face or a limb painted. Guests also received fun alien sunglasses to wear on the dance floor. 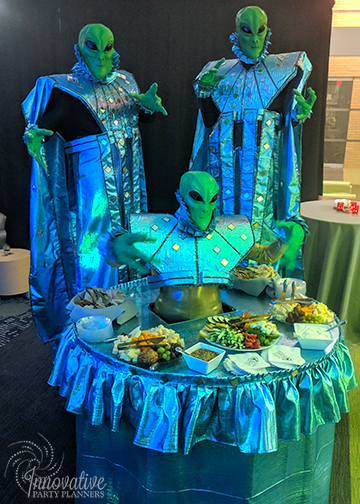 For this supernatural Howard County Library System event, we utilized a futuristic range of colors and fabrics to mimic the sleek and metallic aliens seen in classic sci-fi films. 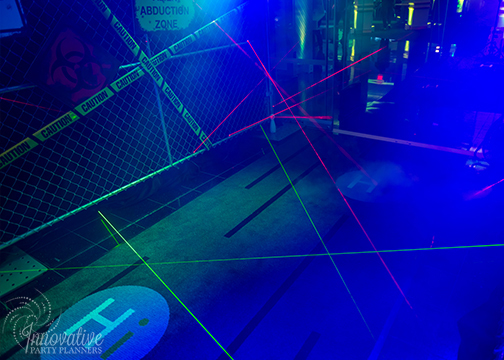 From projectors illuminating the floor with alien heads to customized centerpieces simulating farm animals being abducted by a UFO, every last touch was carefully planned. The creative event raised more than $111,000 in support of the Howard County Library System’s educational initiatives. The Howard County Library System’s East Columbia Branch reopened in February 2018 after receiving an Honor Award for Architectural Excellence from the Maryland Society of the American Institute of Architects. Aside from being a member of the Howard County Library System, this venue was perfect thanks to its innovative design, virtual reality studio, science lab and modern feel. The sponsors of the event were incorporated into the event on UFO-themed graphics visible throughout the mingling space. It was a pleasure to work with the Howard County Library System for the third consecutive year to create such a special and supernatural event!